MONTGOMERY, Ala. (AP) — Alabama asked a judge Friday to halt a decision that struck down a state law protecting Confederate monuments as the state appeals the ruling. In a motion, Alabama Attorney General Steve Marshall said a stay would prevent Birmingham, and perhaps other cities, from removing Confederate monuments while the state appeals the decision. A judge last week ruled a 2017 state law barring the removal or alteration of historical monuments violates the free speech rights of local communities. The ruling came after the state sued Birmingham for erecting a wooden box that obscured the view of a Confederate monument in a city park. Marshall said the state is appealing and he believes the law will be upheld. “We believe the court’s decision against the Memorial Preservation Act will be overturned due to the fact that it incorrectly assigns the right of free speech to a government subdivision,” Marshall said in a statement. The 2017 Alabama Memorial Preservation Act prohibits relocating, removing, altering or renaming public buildings, streets and memorials that have been standing for more than 40 years. The legislation doesn’t specifically mention Confederate monuments, but it was enacted as some Southern states and cities began removing monuments. 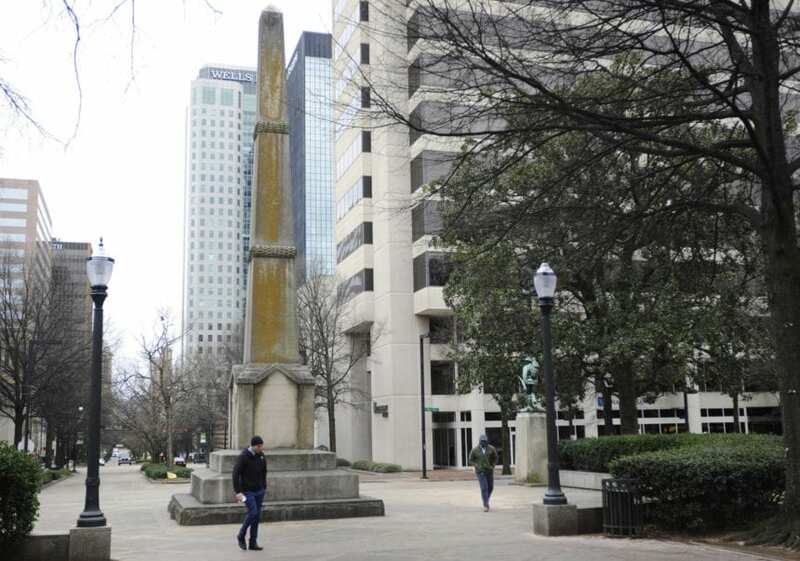 Birmingham officials had discussed removing a 52-foot-tall (16-meter-tall) obelisk that was erected to honor Confederate veterans in a downtown park in 1905. After the monument protection law was approved, the city instead put wooden panels around it. City workers began installing the panels days after deadly violence over a Confederate monument in Charlottesville, Virginia. The attorney general’s office sued Birmingham in 2017 which led to a judge declaring the law void. Birmingham’s population of 210,000 is more than 70 percent black. In his ruling striking down the law, Jefferson County Circuit Judge Michael Graffeo said it was indisputable that most citizens are “repulsed” by the memorial. He rejected the state’s arguments that lawmakers had the power to protect historical monuments statewide. The attorney general’s request said a stay would allow Birmingham to keep the wooden screen, but not remove the monument, while the state appeals.